Courts Open Day is a Law Week tradition. To celebrate Victoria’s festival of the law, the state’s courts open their doors to the public, letting you see where the law is carried out. This year, Courts Open Day is back and better than ever, with heaps of fun activities for people of all ages. From 10am to 3pm on Saturday 18 May, Victoria’s courts are showing you behind the scenes of our justice system. With more than twenty events and activities spread across Melbourne’s legal district, there’s bound to be something to interest you at Courts Open Day 2019. Sit in on real bail and remand hearings at Melbourne Magistrates’ Court, watch a mock trial at the County Koori Court, venture beneath the County Court to see its holding cells, grab a sausage cooked by a judge and meet Coop, the Supreme Court’s support dog! There will also be heaps of family-friendly entertainment at the County Court Forecourt and roving between courts in the legal district. Friendly Victoria Law Foundation staff and volunteers will be there to help, too. 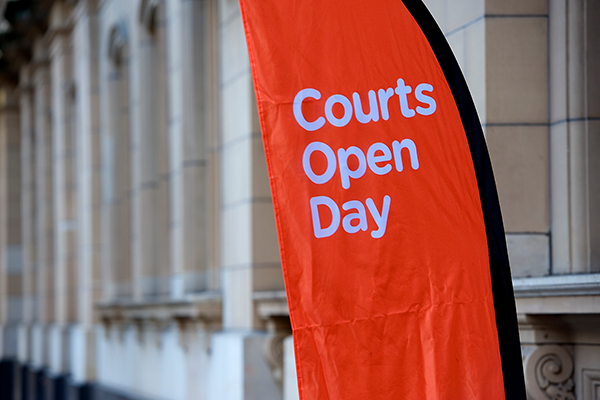 Check out the full list of Courts Open Day events – as well as some useful hints and tips about how to get around. Come and unlock your law at Courts Open Day on Saturday 18 May.